Abstract: This article describes an electrical model of a thermalmagnetic circuit-breaker that can accurately simulate characteristic behaviour over a wide range of overcurrents, including operation in the magnetic region. The model has been validated against measured waveforms from both a high-current DC test facility and a distributed power system rack. The circuit-breaker model can be coupled with other distribution component models to simulate the protection performance in telecommunications DC distribution systems. The design and analysis of over-current protection for telecommunication DC power systems can be greatly assisted by the use of a computer-aided simulation tool. However, a simulation is only as accurate as the component models and element values used to represent the real world. This article reports on the development of a circuit-breaker model that can accurately represent circuit-breaker behaviour over a wide range of overcurrents. The performance of protection, distribution and storage devices significantly affects both the reliability and safety of the DC power system. 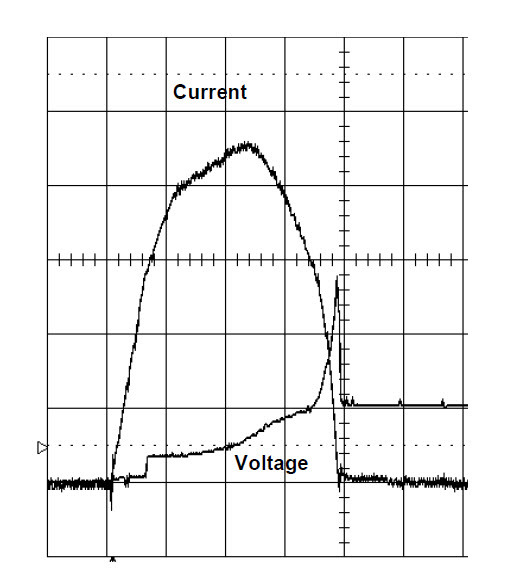 Voltage excursions caused by an over-current instance can cause electronic equipment to malfunction due to over-voltage, and disrupt service due to under-voltage. Poor discrimination between protection devices can cause upstream device operation, resulting in major interruption to service. 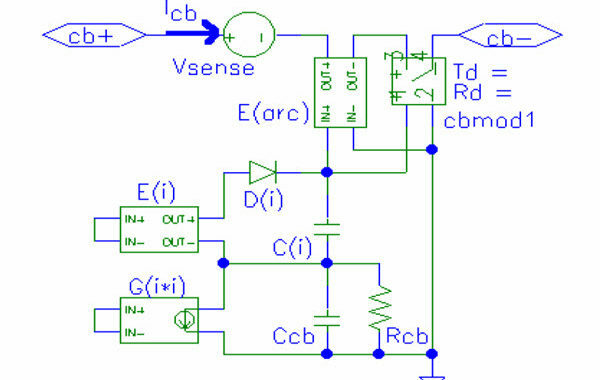 The rapid advancement of both computing power and analogue circuit simulation programs derived from SPICE software provides a relatively user-friendly environment for over-current protection design and analysis. This is advantageous as telecommunications power distribution systems are often large and complex, and developing an equivalent circuit model for a power system is not a trivial task. The circuit-breaker model described in this article implements the enhanced modelling functions available with PSpice’s Analog Behavioural Modelling to include circuit-breaker current, time and arcing dependent characteristics. This model complements and extends previously published modelling work [1-2] by Telstra Research Laboratories on other power system components. A typical thermal-magnetic circuit-breaker operates (trips) in two distinct modes; the thermal mode occurs for device currents from 1 up to about 10-15 times the rated setting current, and the magnetic mode occurs for all current levels above the thermal operating region. Characteristic current-time curves for the device operating in the thermal region can be approximated by an equation where i n t equals a constant, whereas in the magnetic region the operating time (typically <20ms) is not well defined in device data curves and specifications, as test circuits are based on rectified AC power sources which have typical rise times exceeding a few milliseconds. The circuit-breaker model presented in this paper has been developed for a 125A moulded device (10kA fault rating), which is commonly used to protect individual battery strings within Telstra’s distributed power supplies. 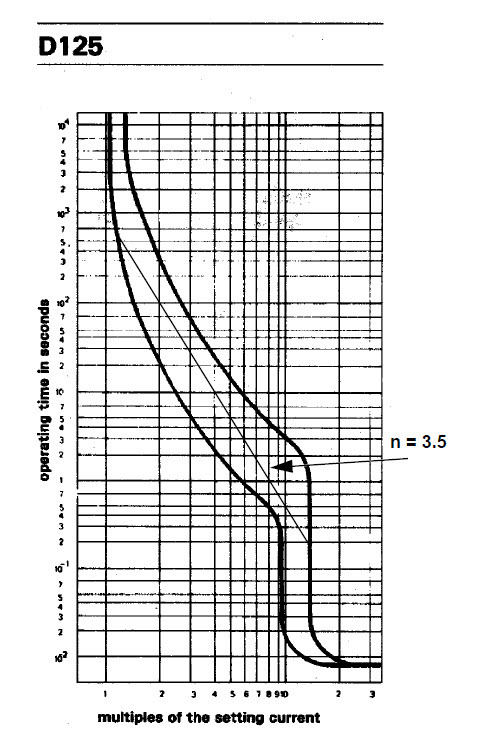 For device operation in the thermal region, the characteristic i n t form of the current-time curve can be obtained from the device specification curve as shown in Figure 1. A value of n = 3.5 gives an adequate fit over the range of currents within the thermal operating region. For device operation in the magnetic region, characteristic current-arc voltage-time behaviour has been observed for the circuit-breakers operating in a high-current DC test facility over a range of current levels and circuit time constants. At the start of such a fault instance, the current passing through the closed circuit-breaker contacts increases to a level where magnetic activation forces the contacts to open. As the contacts start to open an arc is developed which is inherently unstable and a complex voltage-current characteristic occurs as the arc progresses through to extinction. · fast rates of current rise exceeding 10kA/ms, which resulted in short pre-arcing times of about 0.15- 0.2ms (eg. 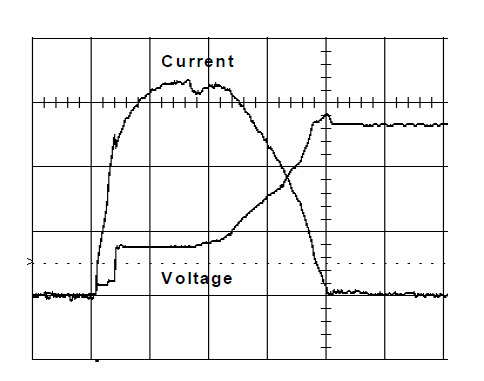 results from a test circuit with 5.4kA prospective current and 0.26ms time constant are shown in Figure 2). · high prospective current levels exceeding 10kA, which result in pre-arcing times around 0.9ms for circuit time constants of about 1.2ms, as shown in Figure 3. It should be noted that special oscilloscope probing and current shunt techniques are required to record clean waveforms in the high transient noise environment that occurs in a high current test facility.